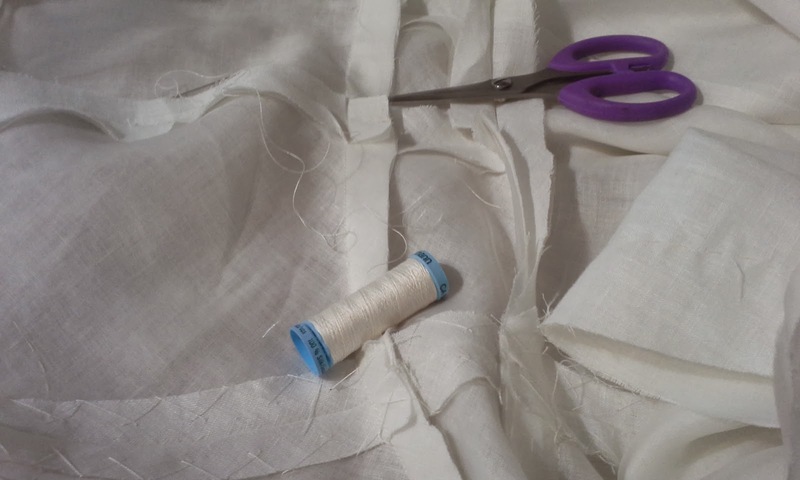 The muslin and organza laid out to cut the linen. Over the past week, I have been working on the actual dress for the Little White Dress contest on Pattern Review. I only have 12 days left. I really thought I would be done by now. This is Vogue 8648 and I am using couture techniques as described in Susan Khalje's Craftsy Class, The Couture Dress. I used the fitted muslin as my pattern to cut the organza. Then, I was supposed to use the organza to cut each piece of fashion fabric. In this case, it is linen. Since I was concerned about the tracing lines, I decided to keep the muslin attached to the organza. Just in case the traced lines didn't show. I'm so glad I kept them together. Once the white traced lines on the white organza was layered on the white linen, the lines disappeared. Thread tracing and hand basting the Little White Dress has been tedious. I have spend a few days doing this. I was so concerned that using white wax tracing paper wouldn't show up on the white silk organza. Then when I tried it, it did show up. But not once I put it on the white linen. seam lines. This took a couple of days. 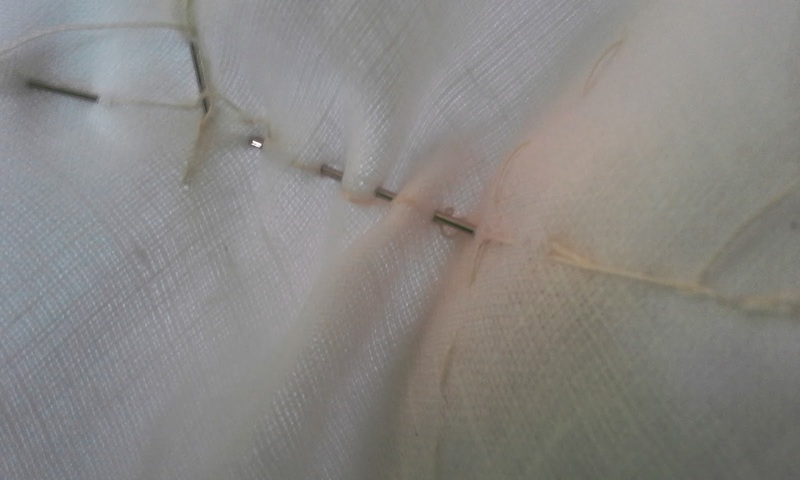 To get the stitch lines, I ended up folding back the muslin and pinning almost on the line. 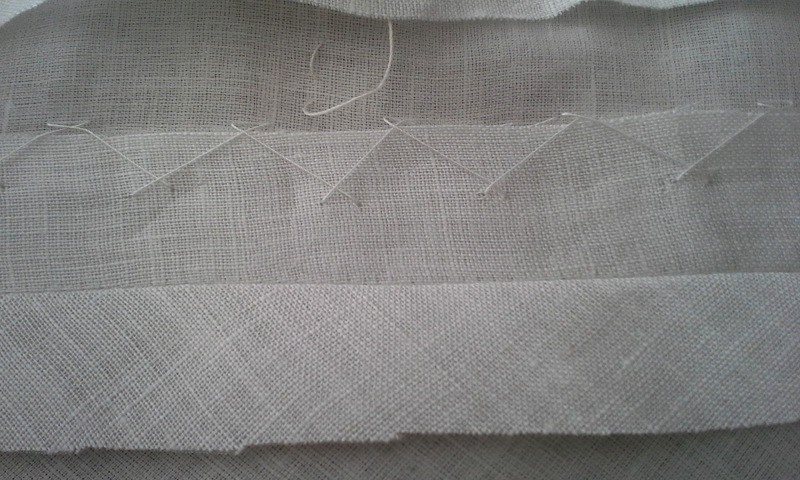 I then used a running stitch to baste the organza and linen together. 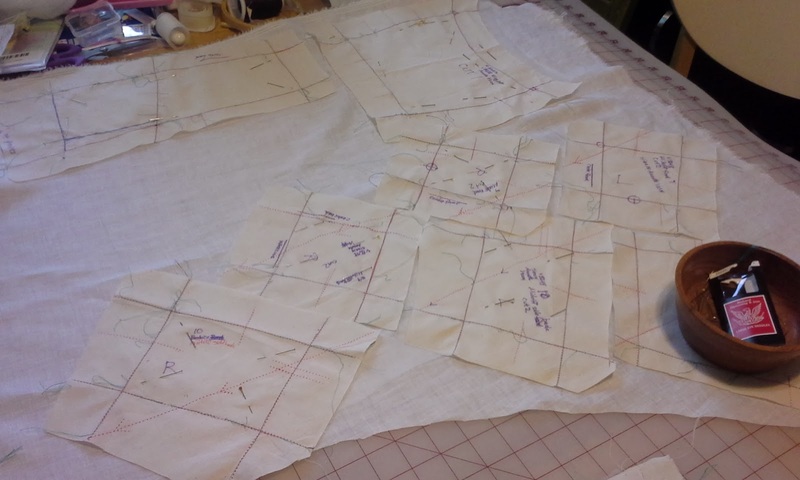 These lines will also be used as the guide to stitch the pieces together when I baste. And if all goes well when assembling with the machine. This was tedious pinning and I poked myself a number a times so I tried something else. an hour or so. Be sure to test before trying! I have a couple of marking pens. I decided to try an air pen. The ink on an air pen disappears without having to moisten. But it also can be removed more quickly with water. 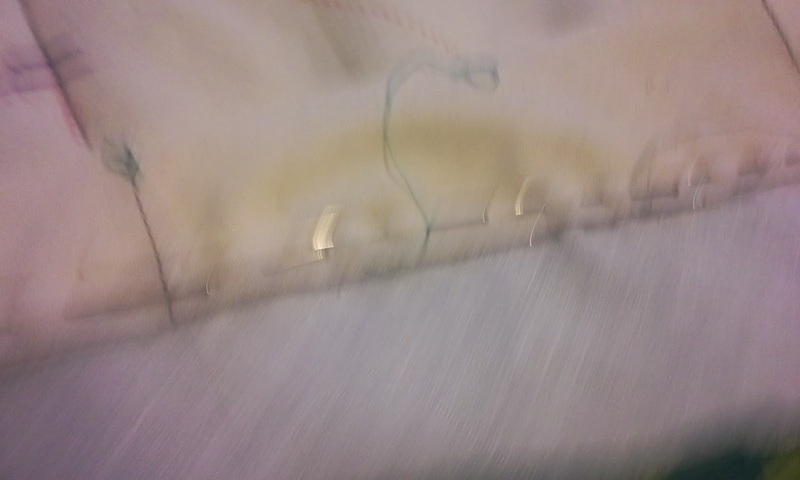 I decided to check on a scrap of organza and linen to see how it would react. It came out! 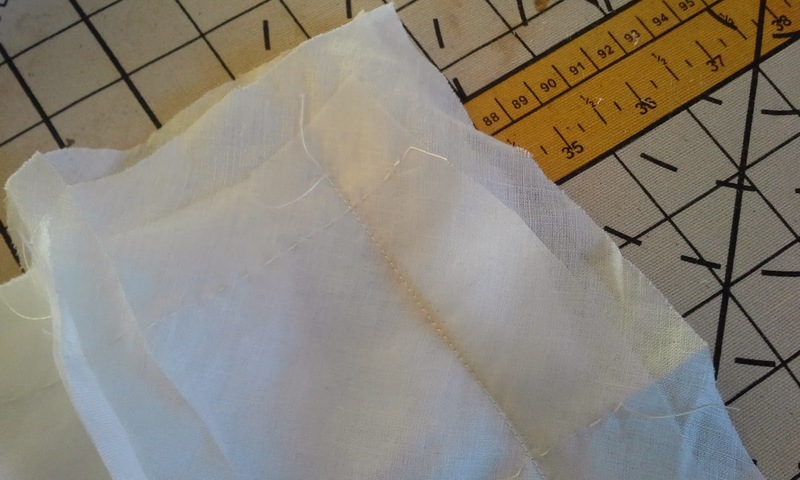 I then traced the lines by putting a dark paper between the organza and linen and tracing carefully. I then proceeded to thread trace. I could use the marker on one piece at a time because it disappeared quickly. I had to trace one piece twice because it disappeared while I was making the family dinner. They really don't get that I would prefer to sew than eat. I started thread tracing and basting on Thursday or Friday and finished sometime towards the end of the Super Bowl. Actually, I finished the bodice and the midriff. The skirt is a circle skirt and I wasn't really worried about the fit. I was getting lazy and pin basted a spare zipper. I was surprised to see that I needed to take it in...a lot. I also needed help getting the zipper closed so that I didn't die by a thousand pin pricks. More importantly, I didn't want to bleed all over the white fabrics. Now, I think Mr. Toad needs to take a fitting class. Trying to explain what I needed, just confused him. So, I had him help with the zipper and took it off and on, pin fitting until it was right. The seam allowances are catch stiched to the organza. The stitches do not go through to the right side. Mr. Toad did not realize that this is my fashion fabric. He thought it was a muslin. He said it looked like a" haysack." Don't worry. There is no divorce looming. I understand that the wrinkly linen, with bulging seam allowances and unfinished edges may look less than beautiful to him. I will forgive him and remind him that we don't say that to a wife at that point in the project. Especially at night. I was able to machine stitch everything and assemble the dress today! 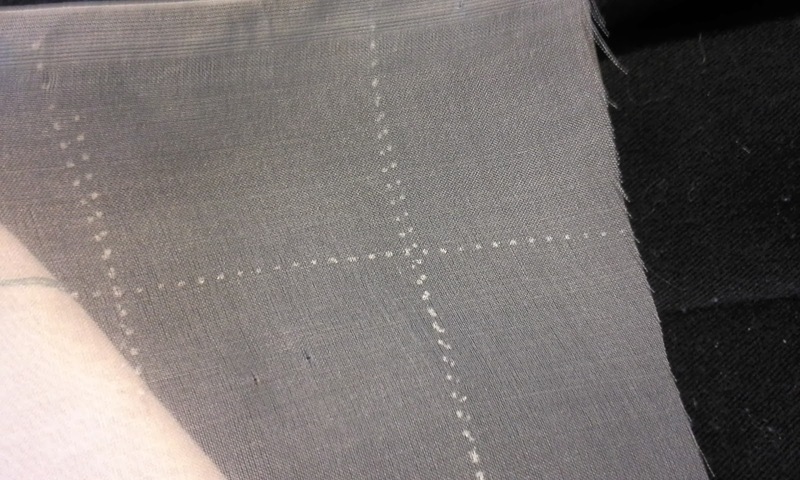 Once stitched together, I removed all the basting thread, and pressed the seams, then pressed them open. Finally, I trimmed the seam allowances. I tried to leave them at about one inch, but the Big 4 have trained me to see 5/8 inch as appropriate. After the assembly and the seams were pressed and trimmed, I started to catch stitch them. That is where I am now. 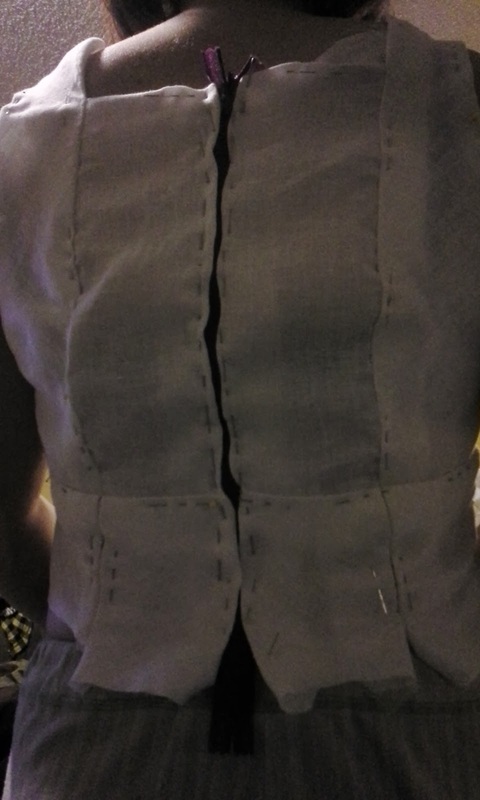 I don't know if I will finish the taming of the seams, but tomorrow, I am going to cut the lining. If all goes well and no unforeseen problems or requests on my time, I should finish on Wednesday. Most likely it will Thursday afternoon, because that will be my first chance to get a white zipper. Yep. I forgot to buy a zipper. What a labor of love! I have considered that class, but wondered if it would be too detailed for my style of sewing. It will be interesting to see the finished product! Nancy, this dress has taught me so much. The class is wonderful. I bought it over a year ago and have used tidbits here and there. It is through making this dress that so much more has been reinforced and learned. I encourage you to take it. If you make the dress, it is even better. I'm not done with this one and I am already considering different variations! I will also post a full review of the class when the dress is finally done. 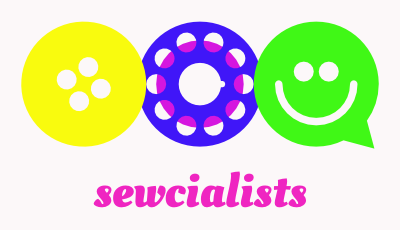 I'm a sewcialist. What about you? This is that awkward post. Perfect Pattern Parcel #4--All About Boys!!! !